What do 2,200 varieties of plants, all in containers exposed to a merciless Southern Ontario summer, look like? Awesome. The Sawaya Container Trials, one of North America’s largest, threw open their doors (so to speak) in late July for growers, retailers and members of the Garden Writers Association to check out what’s doing best, what could do better and what makes for vibrant container plantings that thrive into late summer. The Sawaya Container Trials expose container plants to a typical Southern Ontario summer. 2,200 containers are grown in normal gardening conditions at the Sawaya Container Trials. Shot in July, 2015. As Mel Sawaya led a small group of garden writers and bloggers (including yours truly) down the rows of containers, his opinions, tips and ideas had many of us furiously writing notes. Here are three of his surprising pointers (with more to follow in coming posts). 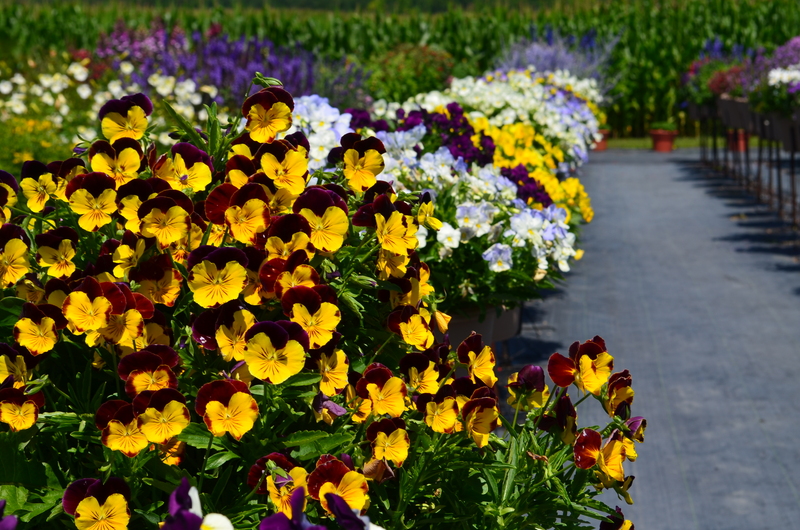 Pansies and Osteospermums are typically sold in garden centres at the very beginning of the Canadian gardening season and then disappear from shelves to make room for traditional “summer” flowers. Pointing to a long row of pots overflowing with vibrant pansies (this is late July), Mr. Sawaya rhetorically asked “Why?” Why not, indeed. 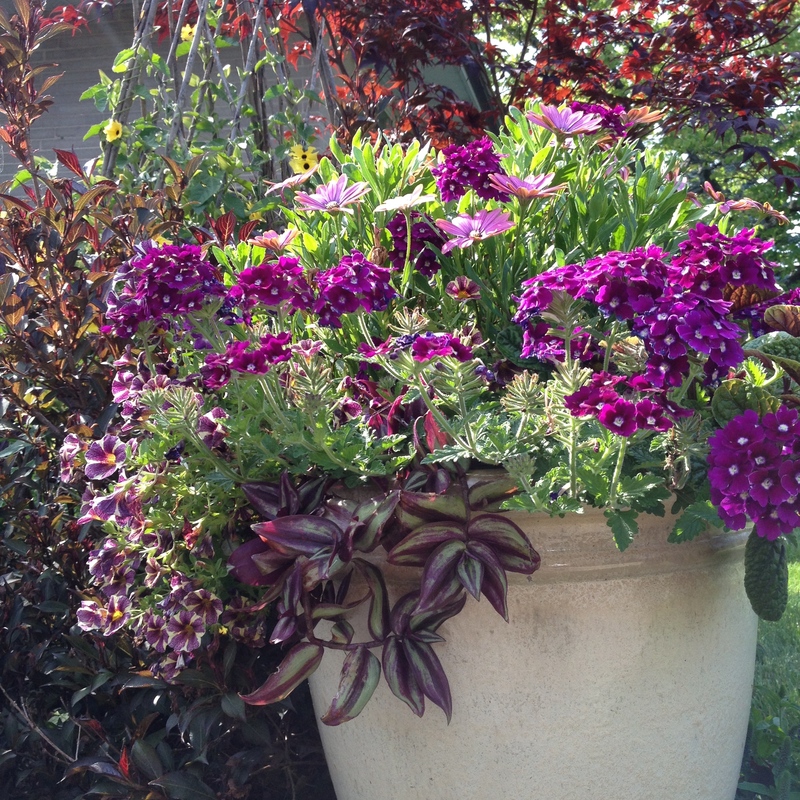 As proven here, they can add jolts of colour to a container planting all summer long. These pansies (shot on July 23rd) prove that they’re not just a spring flower. Osteospermum Akila White with Purple Eye. Here’s a container in my own garden that I’d planted in early spring. The Osteospermum (seen at the top centre of the grouping) have done well despite several heat waves and missed waterings. But I do deadhead them whenever I can. Admitting that you “torture” plants may not make you the most popular guy at a garden party but it’s all in a day’s work for Sawaya. 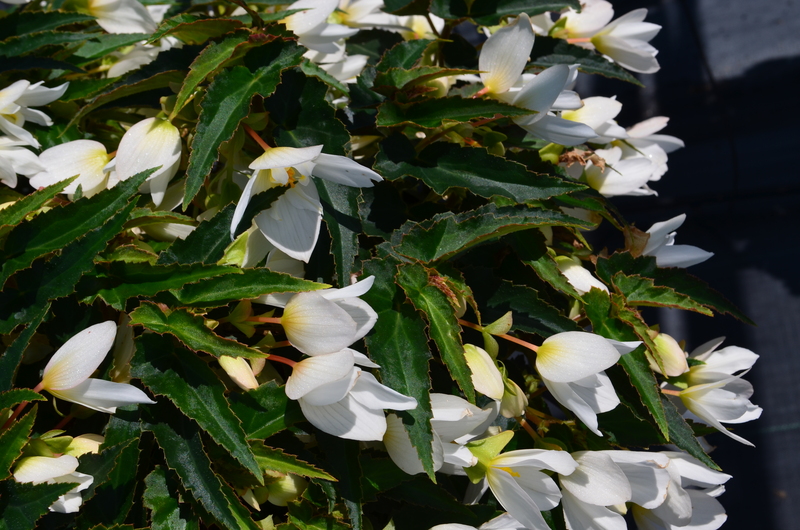 And one plant that has come through his trials exceptionally is the begonia. He’s found that this plant, typically marketed for shade gardens, does very well in glaring sunlight. Citing that begonias are “the number one plant in Texas”, he makes you think he’s on to something. So for some easy care interest on a bright patio, try busting out some begonias. A real Wow! moment came when Sawaya showed us some of the plants that were starting to suffer from powdery mildew. (Keep in mind that all the plants in his trials are not subjected to pesticides or herbicides of any kind. The idea of the trials is to see what plants do well under normal gardening conditions.) Yes, there were the usual victims–impatiens. 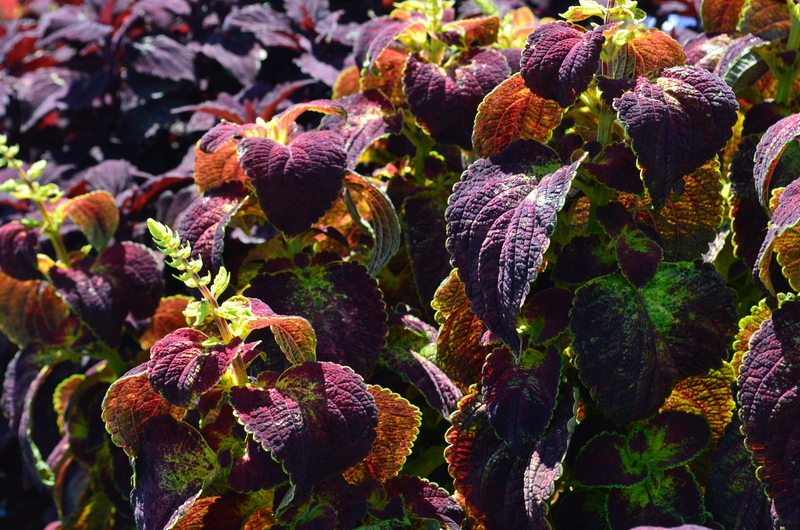 But a whole row of coleus was labelled as infected by powdery mildew as well. It’s a different strain of the fungal disease but the results are the same. Sawaya said that even herbs such as basil can get it. So if some of your container plants are starting to look a little the worse for wear as the summer rolls on, check under the leaves to see if you can spot a grey or brown powder-like coating. You may be better off taking that plant out to save the rest of the container planting. Coleus can fall to powdery mildew as well as impatiens.